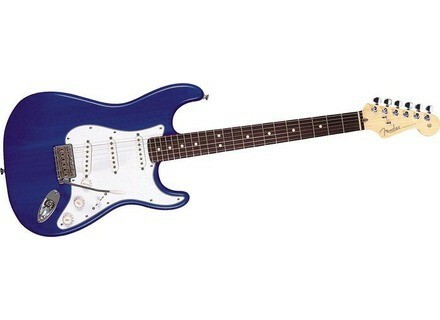 Highway One Stratocaster [2002-2006], STC-Shaped Guitar from Fender in the Stratocaster series. Product replaced by the Fender Highway One Stratocaster [2006-2011]. Great guitar, very comfortable, violin US forces. Electronics in good order. - The varnish, he quickly takes the bread, it makes a style, but be warned, if you're the kind of love the guitar effect "new" is going to require attention. - The vibrato and mechanical are not terrible, I did not change (I have the guitar for 2 years) so it's not a "problem" but sometimes I find it lightweight. Nothing alarming though. Nothing to say about the use, super comfortable, nice, Fender is USD. No worries. - The pickups are very good in serious but weaklings in acute I think. It's hard to judge this, I have not had time to try on many amps, but be sure to have a proper gear at the output for a good audio performance. 2 years and a half of service, this guitar is a must-have for beginners who already have the passion or those on a budget. - The level is a good fender so we quickly find the sound of Jimmy Hendrix or Pink Floyd, its a typical fender. I play with a Marshall Valvestate amp, and I find in this guitar is irreplaceable clean and overdrive with the amp is just as well, however, when he put a Boss Metal Zone distortion like to play the Metal or Hard Rock is on the microphone I prefer the SG or Les Paul, although playing with the layer distortion is a pleasure. I use this guitar for almost two years and I never loose, the whole myth of Fender under the fingers ... the only small BMOL .... it's painted on the highway a patent spcial moin CHRE allowing just lower their selling price ... so I really like the fact of seeing wood grain is polished but this class is not very strong and rapidly is emerging multiple small pets at the same time ... it is what gives the charm a strat right? Channel ultra pleasant and I had 70 layers of today has an acute attack strat what? For all bluesy style but rather what strat rcock etc. Use for 1 year only the varnish is lege but quickly erased by the quality of the instrument of occas you do go for fender regrtterez not just shooting ourselves in the foot two times cheaper than standardized by far on stage no diffenrence seen the state of that of vaughan hendrix or clapton or even the time they would certainly utils cetteguitare slight edge to the sound without effective default on certain of sound that is not obvious already standardized the price then the weight and sound! I think everything has t say about this guitar, loved by some, criticized by others, it is clear that Fender has made strong with this SERIES, a US out of this quality that price, other manufacturers would do well amricains to look more prs. Alder body, handle stocky, the 3 single coils are well known, a 5-way switch. The economy has a share of mcaniques, the vibrato, but especially late varnish that covers the body. The thin thickness of the varnish is felt in much of the sound, for it is against sensitive to scratches. In short nothing major. Apart from the Fender sounds are for those who like a vritable happiness, the strength of this guitar is its exceptional jouabilit. The handle is a rgal, I am Pitre guitarist, playing on this guitar but I can vritable a fun game. For sounds, with diffrent combinations and playing on SETTING THE tone of the amp and it was a nice bunch who caractrise the versatility of this guitar. Only actually large saturations will be difficult, it takes double coils for a. The jazzy sounds trs clean, blues, rock, funky pots, dj not bad for a MODEL of quality. I have a hybrid amp, a DJ will rev well, but as an all-tube, the sound should be even more sublime. I personally did not complain too much noise with single coils read, I can be a MODEL t you it changed? I modified this guitar rcemment by changing the original pickups for 3 Lace Sensor Gold m'tre and I must admit took a big blow at her, more powerful and crystal clear as the original, the twang Fender is divine and sublime harmony, I can now advise homeowners of this guitar to change the original TRS good microphones that I liked well yet beginners, instrument making the MRIT. I spend my note of 8 10. I have been using ending for one year. What made me crack is the relation quality price (in addition to purchase) with the exprience I would do this choice, and I think even me slowly up a collection Fender vintage guitar that I was given the virus of the brand. NB: If the single-coil pickups Fender dlivrent a beautiful sound flt Features and recognizable sound gnrent it is not really musical. The guitar and amliore demonstrated a thundering silence. We find that the charm of the Start without inconvnients ... What sound! So to buy your Start, open your ears and Listen, Listen ... no need to pay more that can be found in the range US Highway ... that price !!!!!!!!! !!!!!!!!!!!!! Now she has everything a great! I for one button and rosewood color Saphire Blue Transparent. A stratum in all its plendeur: trs comfortable handle, ergonomic Access in acute ais remarkable as that sitting upright. We easily obtained a good sound especially in the clean sounds and the blues / crunch. Short as happiness. This layer can cover a large variety of styles and sounds crystal clear to saturation rock (rock I mean anything that does not affect the large saturation mtal and others, yes it is a stratum which we speak!). I use a JCM900 (I know it's not the top) and what comes out perfect for me. Edict of 16/12/04: I changed the pickups for a set of Kinman woodstock more and then, the big slap! These microphones are first trs silent but they have incredible momentum. My stratum is transfigured: sometimes I feel like I have the same sound that Jimi is to tell you. Connect to a fuzz and ...... yum!. The sound of the mic positions diffrent is much better and is more Dfine prcis saturation. In addition I have installed the kit and I now have 7 cablge possibility of sounds. Touching a bit of everything musically, I am satisfied trs. I use it for a year now and I still enjoy playing with (his handle is a rgal). I changed the pickups because the breath of microphones m'nervait home and I do not regret (I suggest to do same). Exprience I would do with this choice: excellent qualitprix and the satisfaction of having a new US Fender for less than 1000 euros (and sounds that go with it ). By BMOL against the fragility of the varnish is so late trs trs fragile when I changed the pickups, I saw he had some nice stripes. Be careful not to abuse. The handle I selected rosewood fingerboard is very enjoyable it was a great playing comfort! the guitar is very well equilibrated, the weight rsonnable! and of course a very beautiful form of stratocaster! I use it on a mashall MG100DFX is a great model and its position in the middle of me that loves to play punk grunch and I made plaizir! on the other hand there too much noise of parasites that's why I want the May I rewire it's not how! although it will be one of the player tells me thank you in advance, I re-painting my guitar I had the ALRO necessarily disassemble and I found that the welds and assembly was very well done there a repeat! I use it for 1year and I'm a fan toujoru, one wonders why the others are US CHRE! Nivo qualitson irrprochable and prices! Apart is small pest problem that will soon be rgl ds that j'aurrai advice on the wiring, I would do is choose Siter sen! Despite this question, it remains an excellent mid-range guitar and vintage equipment must contribute a sound strat style anne 50-60. Except that the long one becomes more critical and I started to find that the sound reproduction amliorer silent. So I replaced the mcaniques by Shaller locking, vibrato told by a real vintage modern. Incidentally, two screw vibrato taient visss wrong. But I got better DJ's in addition to the stability of tuning. That left the microphones, screen or change the bte microphones. I have chosen the option of luxury, a plate EMG David Gilmour. Highway and became outstanding but no longer the subject of this notice. Even in passing, two screws on the original fathers had t wrong, tquila abuse? Well, I did not regard the prs plate screws when buying ... (With pulp wood and a good little drill, not too serious but ...) As against the varnish (trs trs fragile mdiator a shot outside of the plate and a hop m sings scratch), where the absence of varnish plutt, seems to contribute a sound reproduction and enjoyable especially compared to American Standard (too much paint-tuft may be sound). In three years, I had bought ds's available in France, my Highway has many volumes as to not be one more. In hindsight, I might be done better to wait and take a Luxury. But the dollar was too high the era. Or take a Xavier Petit ds dpart in the same price as the base price of the Highway + customization, with a guitar of higher quality in the end ... But I removed a certain pleasure in amliorer. "I acknowledge all the same it is quite sduisante at first. -The sound is (but be careful not the sound of a real United States! ), I would say that is an intermediate between the basic and mexico real United States. -It is a pretty versatile guitar. I quite like the look of this guitar thanks to the patent (too late) seem leaving the wood grain. In conclusion I would say the highway its name MRIT stratocaster given its CHARACTERISTICS but it does not merit the appellation probably US guitar because the sound quality and manufacturing is far from perfect! ! !